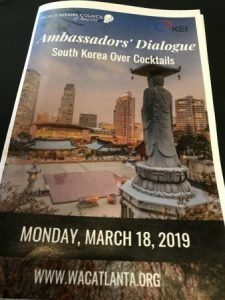 Atlanta, March 18, 2019 — On the eve of SK Innovation’s $1.7 billion battery plant announcement in Jackson County, Georgia, the Ambassadors of Korea and U.S. to respective countries shared a stage to share their insights at an event organized by the World Affairs Council. Ambassador Cho Yoon-Je, South Korean Ambassador to U.S., shared his view on the current economic ties between the two countries and the attraction of Georgia to Korean businesses as investment destination. “Atlanta currently has the third largest Korean diaspora in the United States totaling over 50,000 individuals,” said the South Korean Ambassador. Georgia remains an attractive destination for Korean immigrants and businesses due to its moderate climate, low cost of living, and business opportunities, adds the South Korean Ambassador. Ambassador Harry Harris, U.S. Ambassador to South Korea, reiterated President Trump’s “Free and Open Indo-Pacific Strategy” in the region. He adds that South Korea plays an important role as a partner in the initiative. The strategy vows to promote a rules-based security and economic order in Asia, while also encouraging closer cooperation among regional U.S. partners. Both diplomats are in town to celebrate the largest ever investment in Georgia by a South Korean company since Kia Motor Company at West Point, Georgia. Kathleen Stephens, former U.S. Ambassador to South Korea and President & CEO, Korea Economic Institute, moderated the discussion by the two distinguished diplomats. Over 150 guests attended the event hosted at The Commerce Club in downtown Atlanta.